Integral Role of Transthoracic Echocardiography and Clinical Predictors of Mortality in Septic Shock Patients. There is conflicting data on the prognostic value of transthoracic echocardiographic (TTE)- determined diastolic function in critically ill patients with septic shock. We sought to identify the echocardiographic and clinical predictors of in-hospital and 90-day outcomes in septic shock. 248 consecutive patients admitted to the ICU with septic shock were retrospectively studied. Comprehensive baseline characteristics were obtained. Multivariable analysis was used to identify independent predictors of mortality. Mean age was 64.9 ± 18 years (51% men), and mortality rate was 23% in the ICU and 33% within 90 days of hospital admission. Multivariate analysis revealed 3 independent predictors of ICU mortality: ratio of mitral E wave to early diastolic velocity of medial mitral annulus (E/e’) (odds ratio [OR]: 1.04, 95% CI: 1.0-1.08, P<0.05), APACHE II score (OR: 1.07, 95% CI: 1.0-1.1, P<0.05) and lactate levels (OR: 1.37, 95% CI: 1.2-1.6, P<0.05). Patients with E/e’ medial ratio >15 had 3.78 times the odds (95% CI: 1.87, 7.65) of ICU mortality compared to patients with E/e’ <15 (P=0.0002). Independent predictors of 90-day mortality were advanced age (OR: 1.02, 95% CI: 1.0-1.04, P<0.05), urine output (OR: 1.13, 95% CI: 1.1-1.2, P<0.05), low hematocrit (OR: 0.93, 95% CI: 0.88-0.98, P<0.05) and inferior vena cava size (dilated versus normal: OR: 2.02, 95% CI: 1.05-3.85, P<0.05). Our study reemphasized the usefulness of E/e’ in critically ill patients, negating prior reports of the lack of value of this parameter. Echocardiography, Septic shock, Mortality, Diastolic function, Filling pressures. Sepsis is a complex clinical syndrome caused by a dysregulated host inflammatory response to infection, leading to acute lifethreatening organ dysfunction . The inflammatory response results from pathogen-mediated host immune cell stimulation and sequential activation of pro-inflammatory mediators to eradicate invading microorganisms [2,3]. The exuberant inflammatory response that ensues in sepsis propagates systemic inflammation with resultant end stage damage to the host tissue. Septic shock is the most severe form of sepsis in which profound hemodynamic collapse has ensued despite adequate fluid resuscitation, resulting in substantially increased mortality with reported ranges from 30%-50% [4-6]. Sepsis is a major cause of admission to the intensive care unit (ICU). It is currently ranked as the 10th leading cause of death in the United States and the leading cause of death in non-coronary ICUs . Sepsis is a major public health concern, accounting for more than $20 billion of the total US hospital costs, and its incidence is increasing given the increased number of aging patients with chronic conditions . Myocardial dysfunction is a common morbid consequence of severe sepsis and septic shock that has become increasingly more recognized over the past 3 decades [9-11]. While the exact pathophysiologic mechanisms are not well understood, myocardial depression is thought to be due to circulating inflammatory cytokines and dynamic adaptation of the cardiovascular system [12,13]. Sepsis-induced cardiac dysfunction is characterized by impairment in contractility, diastolic dysfunction (DD) or both [14-16]. Existing literature contains a sizable body of work on systolic dysfunction in sepsis [17-20]; however, less is known about DD and its prognostic implications in critically ill patients with septic shock [21,22]. The present study was aimed at identifying the transthoracic echocardiography (TTE) features and clinical parameters that best predict ICU and 90 day mortality in patients with septic shock, with particular attention to the importance of septic shock mediated DD. This study also assessed the role DD severity by grade on outcomes in septic shock. Furthermore, whether DD was worsened or occurred as a consequence of septic shock was investigated. Henry Ford Hospital (Detroit, MI) is a tertiary care center with a large medical ICU comprising 68 beds. We retrospectively reviewed a total of 248 consecutive patients admitted to the ICU with septic shock between January 2011 and April 2013. Patients with septic shock were identified by a computer search of the diagnostic codes-according to the International Classification of Disease, 9th Revision-of all discharge diagnoses. The medical records of all of the patients with a diagnostic code for septic shock were then manually reviewed for verification by investigating physicians. Baseline demographic, clinical and TTE data were obtained at time of ICU admission by reviewing the electronic medical records. Follow-up data was obtained through a review of medical records and the Social Security Death Index. The Institutional Review Board of Henry Ford Hospital approved the study. Patients were included for analysis in this investigation only if they met criteria for septic shock, defined as known or suspected infection with 2 or more signs of systemic inflammatory response syndrome, organ dysfunction, and hypotension defined as systolic blood pressure less than 90 mm Hg or mean arterial pressure less than 65 mm Hg after a 30 mL/kg fluid bolus or requiring vasopressor therapy. Excluded were patients with suspected cardiogenic shock, acute myocardial ischemia, severe mitral or aortic valve disease, preexisting severe impairment in left ventricular ejection fraction and patients with poor echocardiographic image qualities. Univariate analysis was performed using independent t-tests for continuous variables, and using chi-square tests for categorical variables. Multivariable models were built using clinically relevant variables with P<0.05 univariate results, then reduced using manual backwards selection to arrive at a final model identifying independent clinical, systolic and diastolic TTE predictors of mortality during ICU stay and within 90 days of hospitalization. Adjusted odds ratios and 95% CIs were determined. Doppler tissue imaging of the mitral annulus was obtained from the apical four-chamber view, using a 1 to 2 mm sample volume placed in the septal mitral valve annulus. Enlarged inferior vena cava (IVC) diameter was defined as >2.1 cm at end of expiration measured 3 cm from right atrium, as per the American Society of Echocardiography guidelines. DD was graded using echocardiographic Doppler variables, designated as normal, mild (grade I), moderate (grade II) or severe (grade III) dysfunction . The association between diastolic grade and clinical outcomes was done using Fisher’s exact test. A cohort of 58 patients from our initial septic shock database with a prior TTE within 1 year prior to ICU admission were identified to compare pre- and post-septic shock DD. Paired ttest was used to assess for differences in pre- versus post-septic shock echocardiographic parameters. P-values less than 0.05 were considered statistically significant. All analyses were performed using SAS version 9.2 (SAS Institute Inc, Cary, NC). A total of 248 patients admitted to the ICU with septic shock were studied after exclusion of 52 patients who met our exclusion criteria. The mean ± standard deviation age was 64.9 ± 18 years and 126 patients (51%) were men. Systolic dysfunction (ejection fraction <50%) was evident in 70 patients (28%). There were 120 (48%) patients who were mechanically ventilated at the time of echocardiography examination. Sources of infection were respiratory (39%), genitourinary (29%), intra-abdominal (16%), skin/soft tissue (7%), and miscellaneous (9%). ICU mortality rates based on the source of infection were intra-abdominal (43%), respiratory (25%), genitourinary (18%), skin/soft tissue (5%), and miscellaneous (9%). Documented infection with positive source cultures was present in 220 patients (89%). Mean mortality in the ICU and at 90-days after hospital discharge were 23% and 33%, respectively. There were no significant differences observed between hospital survivors and nonsurvivors with regards to baseline demographics (Table 1). Clinical and echocardiographic data comparing patients who died in the ICU with those who survived are summarized in Table 2. Table 1. Baseline demographics of surviving vs. deceased septic shock patients. Table 2. Clinical and echocardiographic data among surviving vs. deceased septic shock patients. Univariate Cox regression analysis yielded significant associations between ICU mortality and APACHE II score (P=<0.001), lactate level (P=<0.001), urine output (P=<0.001), vasoactive medications (P=0.005), E wave (P=0.04), E/e’ medial (P=0.046), right atrial pressure (P=0.017) and IVC size (P=0.007). Adjustment for urine output and IVC size in the multivariate analysis revealed the following 3 variables as independent predictors of ICU mortality: ratio of mitral E wave to early diastolic velocity of medial mitral annulus (E/e’), APACHE II score and lactate levels. Table 3 displays survival in patients dichotomized according to E/e’ medial ratio >15, confirming an excess mortality associated with an elevated ratio. Using the odds ratio, patients with E/e’ medial ratio >15 had 3.78 times the odds (95% CI: 1.87, 7.65) of ICU mortality compared to patients with E/e’ <15 (P=0.0002). Table 3. Multivariable analysis for predictors of ICU mortality. The univariate analysis for 90-day mortality in septic shock revealed the following variables to have significant associations with higher mortality: age (P=0.008), temperature (P=0.03), mean arterial pressure (P=0.027), low hematocrit (P=0.037), APACHE II score (P=<0.001), lactate level (P=0.002), BNP (P=0.013), urine output (P=<0.001), vasoactive medications (P=0.019), left ventricular ejection fraction (P=0.025) and IVC size (P=0.007). Multivariate analysis revealed the following to be independent predictors of mortality at 90 days of hospitalization: advanced age, urine output, low hematocrit and IVC size (Table 4). When comparing patients with dilated versus normal IVC size, both groups had similar net fluid balance within the first 24 h of ICU admission (2413 ml versus 2420 ml, P=0.99). After dichotomization according to E/e’ medial ratio <15 versus >15 (Figure 1), the proportion of patients with lower E/e’ medial surviving through 90 days of ICU admission was significantly higher than the proportion of patients with a higher E/e’ medial (P<0.0001). Anemia has been associated with diastolic dysfunction . We assessed the correlation between low hematocrit levels and average mitral E/e, and found that there was a weak positive correlation (R=0.129). Table 4. Multivariable analysis for predictors of 90-day mortality. 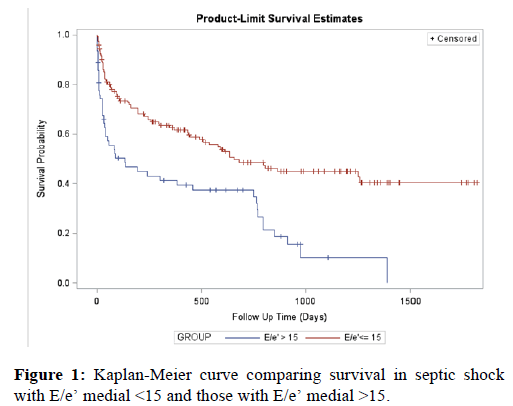 Figure 1: Kaplan-Meier curve comparing survival in septic shock with E/e? medial <15 and those with E/e? medial >15. Our study demonstrates that E/e’ medial annulus, in conjunction with clinical parameters, may help identify septic shock patients with even higher mortality risk beyond traditional clinical and TTE parameters. The ratio of early transmitral flow velocity (E) to early diastolic septal mitral annulus velocity (E/e’) has been shown to be the most accurate non-invasive predictor of elevated left ventricular filling pressure . Previous data have confirmed excellent reproducibility in this measurement and have demonstrated an E/e’ ratio >15 to be the best Doppler predictor of an elevated (>12 mm Hg) mean left ventricular diastolic pressure . In the present study, an E/e’ medial ratio >15 was found to be a significant predictor of short-and long-term mortality in septic shock. The severity of DD by grade and its association with outcomes in septic shock has not been studied, to the best of our knowledge. In our study, we found that DD severity appears to correlate with increased early and late mortality in septic shock; however, larger sized studies are needed to verify the statistical significance of this observed trend. Another previously unaddressed question was whether sepsis was responsible for transient DD or whether the DD was in fact a pre-existing condition. Our results reveal that there was evidence for DD preceding septic shock; however, there appeared to be a significant progression of DD as evidenced by a higher E/e’ as a consequence of septic shock. Our study also revealed that enlarged IVC diameter determined by TTE, a surrogate for elevated right atrial pressures, was a strong predictor of late mortality. IVC diameter enlargement did not appear to be a reflection of the amount of intravenous fluid resuscitation administered, as the net fluid balance was similar between patients with and without IVC dilatation. However, we found that patients with dilated IVC size did have a higher white blood cell count and lactate level and higher rates of mechanical ventilation suggesting worse signs of septic shock and end organ injury. Septic shock is the final stage of a disease continuum that begins with infection and progresses to bacteremia, sepsis, severe sepsis and ultimately septic shock . Septic shock is the leading cause of ICU morbidity and mortality. The frequency of hospitalization for severe sepsis doubled between 1993 and 2003 and continues to grow rapidly, with mortality of severe sepsis remaining as high as 40% despite significant advances in treatment [27,28]. Acute, profound circulatory collapse resulting in multi-organ failure is the hallmark of septic shock . During septic shock, vasodilatory effects of bacterial endotoxin and endogenous vasopressin deficiency alter the systemic vascular resistance resulting in misdistribution of blood flow and inadequate oxygen delivery . Septic shock also has a cardiogenic component secondary to cytokine-mediated myocardial suppression and impaired sarcoplasmic reticulum calcium release, which causes myocardial systolic and DD . Prior echocardiographic studies have shown that impaired systolic function is common (20%-60%) in patients with septic shock; however, it tends to be reversible in those who survive and paradoxically associated with better outcomes [14,17,19,22,32]. Although TTE is an integral component of workflow in critically ill patients, studies have not shown standard TTE findings to be of incremental value over the APACHE 11 score . However, these studies did not incorporate advanced diastolic function analysis including filling pressure estimations, which have since become a standard part of TTE performance. Tissue Doppler imaging is an echocardiographic technique that measures low frequency, high amplitude signals filtered from conventional Doppler imaging originating from myocardium and E’ is relatively insensitive to preload . The ratio of early mitral inflow velocity to mitral annular motion (E/e’) is a reflection of left atrial filling pressures and thus left ventricle end-diastolic pressure and is an integral component of assessment of DD [23,26,35,36]. The predictive value of E/e’ in estimating intracardiac filling pressures have been demonstrated to be robust in various cardiac conditions, including atrial fibrillation, hypertrophic cardiomyopathy, postcardiac transplantation and mitral valve disease [37-40]. However, 2 recent studies have questioned the correlation of E/e’ and intracardiac filling pressures in patients with decompensated heart failure  and unexplained dyspnea . While our study did not specifically assess the predictive accuracy of E/e’ in predicting intracardiac filling pressures, our results do show that E/e’ in patients with septic shock does carry prognostic significance. A high E/e’ ratio represents low left ventricle compliance and is known to predict long-term mortality in various cardiac conditions [43,44]. However, the effects of DD, and hence ventricular filling, on cardiovascular morbidity and mortality in septic shock remains under debate. Whereas Landesberg et al., found a 6-fold higher mortality in septic patients with DD, Pulido and colleagues found no association between DD and mortality in sepsis [22,45]. In a recent meta-analysis of 7 observational studies involving 636 patients with sepsis and septic shock, it was found that DD was common (20%-57%) and was associated with increased mortality . However, this meta-analysis suffered from important limitations, including a varied size of the study populations resulting in a wide range of prevalence of DD (20%-57%) and a heterogeneous mix of patients including those with severe sepsis, septic shock and cancer. Furthermore, it is worthy to note that more than half of the patient population included in the meta-analysis were from 2 studies conducted at the same investigating center, thus potentially biasing the results. To date, no single study has had the power to determine the association of DD on mortality specifically in septic shock patients as done in our study. Our study has several important limitations. First, as a singlecenter retrospective cohort trial in a large urban referral center, our findings may not apply to other patient populations. While early goal directed therapy for the management of sepsis was pioneered at our institution over a decade ago  and has been incorporated into guidelines published by the International Surviving Sepsis Campaign, it is possible that local management strategies of sepsis may have influenced myocardial function and outcomes. Secondly, not all echocardiograms were performed at the same interval of time from ICU admission. While the majority of analyzed echocardiograms were obtained within the first 48 h of admission, in cases where serial echocardiograms were performed an earlier inadequate echocardiogram was substituted for a subsequent more complete study. In such cases, duration of infection and hemodynamics may have altered the analyzed echocardiographic parameters. Thirdly, while tissue Doppler velocity parameters are relatively more load independent than flow measurements, they are nonetheless not completely load independent and may be less reliable when the right atrial pressure is too high or in the presence of arrhythmias, such as atrial fibrillation, which are not uncommon during septic shock. Fourthly, we did not analyze echocardiograms serially to evaluate for recovery of left ventricular systolic and diastolic function, because of the limited number of patients with serially performed echocardiograms in our patient population. Finally, while our study is currently the largest existing study investigating DD in septic shock, it was insufficiently powered to evaluate the association of DD severity and outcomes in this critically ill population. Singer M, Deutschman CS, Seymour CW, et al. The Third International Consensus Definitions for sepsis and septic shock (Sepsis-3). JAMA. 2016;315:801-10. Stearns-Kurosawa DJ, Osuchowski MF, Valentine C, et al. The pathogenesis of sepsis. Annu Rev Pathol. 2011;6:19-48. Matzinger P. Tolerance, danger, and the extended family. Annu Rev Immunol. 1994;12:991-1045. Cavaillon JM, Fitting C, Adib-Conquy M. Mechanisms of immunodysregulation in sepsis. Contrib Nephrol. 2004;144:76-93. Angus DC, Wax RS. Epidemiology of sepsis: an update. Crit Care Med. 2001;29:S109-S116. Angus DC, Linde-Zwirble WT, Lidicker J, et al. Epidemiology of severe sepsis in the United States: analysis of incidence, outcome, and associated costs of care. Crit Care Med. 2001;29:1303-10. Melamed A, Sorvillo FJ. The burden of sepsis-associated mortality in the United States from 1999 to 2005: an analysis of multiple-cause-of-death data. Crit Care. 2009;13:R28. Torio CM, Andrews RM. National inpatient hospital costs: the most expensive conditions by payer, 2011: Statistical Brief #160. Healthcare Cost and Utilization Project (HCUP) Statistical Briefs. Rockville, MD: Agency for Healthcare Research and Quality. 2006. Annane D, Bellissant E, Cavaillon JM. Septic shock. Lancet. 2005;365:63-78. Levy MM, Fink MP, Marshall JC, et al. 2001 SCCM/ESICM/ACCP/ATS/SIS International Sepsis Definitions Conference. Crit Care Med. 2003;31:1250-56. Zaky A, Deem S, Bendjelid K, et al. Characterization of cardiac dysfunction in sepsis: an ongoing challenge. Shock. 2014;41:12-24. Krishnagopalan S, Kumar A, Parrillo JE, et al. Myocardial dysfunction in the patient with sepsis. Curr Opin Crit Care. 2002;8:376-88. Drosatos K, Lymperopoulos A, Kennel PJ, et al. Pathophysiology of sepsis-related cardiac dysfunction: driven by inflammation, energy mismanagement, or both? Curr Heart Fail Rep. 2015;12:130-140. Bouhemad B, Nicolas-Robin A, Arbelot C, et al. Isolated and reversible impairment of ventricular relaxation in patients with septic shock. Crit Care Med. 2008;36:766-74. Ren J, Wu S. A burning issue: do sepsis and systemic inflammatory response syndrome (SIRS) directly contribute to cardiac dysfunction? Front Biosci. 2006;11:15-22. Hunter JD, Doddi M. Sepsis and the heart. Br J Anaesth. 2010;104:3-11. Parker MM, Shelhamer JH, Bacharach SL, et al. Profound but reversible myocardial depression in patients with septic shock. Ann Intern Med. 1984;100:483-90. Ognibene FP, Parker MM, Natanson C, et al. Depressed left ventricular performance. Response to volume infusion in patients with sepsis and septic shock. Chest. 1988;93:903-10. Jardin F, Brun-Ney D, Auvert B, et al. Sepsis-related cardiogenic shock. Crit Care Med. 1990;18:1055-60. Poelaert J, Declerck C, Vogelaers D, et al. Left ventricular systolic and diastolic function in septic shock. Intensive Care Med. 1997;23:553-60. Zanotti-Cavazzoni SL, Hollenberg SM. Cardiac dysfunction in severe sepsis and septic shock. Curr Opin Crit Care. 2009;15:392-7. Landesberg G, Gilon D, Meroz Y, et al. Diastolic dysfunction and mortality in severe sepsis and septic shock. Eur Heart J. 2012;33:895-903. Nagueh SF, Appleton CP, Gillebert TC, et al. Recommendations for the evaluation of left ventricular diastolic function by echocardiography. J Am Soc Echocardiogr. 2009;22:107-33. Nair D, Shlipak MG, Angeja B, et al. Association of anemia with diastolic dysfunction among patients with coronary artery disease in the Heart and Soul Study. Am J Cardiol. 2005;95:332-6. Nagueh SF, Middleton KJ, Kopelen HA, et al. Doppler tissue imaging: a noninvasive technique for evaluation of left ventricular relaxation and estimation of filling pressures. J Am Coll Cardiol. 1997;30:1527-33. Ommen SR, Nishimura RA, Appleton CP, et al. Clinical utility of Doppler echocardiography and tissue Doppler imaging in the estimation of left ventricular filling pressures: A comparative simultaneous Doppler-catheterization study. Circulation. 2000;102:1788-94. Martin GS. Sepsis, severe sepsis and septic shock: changes in incidence, pathogens and outcomes. Expert Rev Anti Infect Ther. 2012;10:701-6. Dombrovskiy VY, Martin AA, Sunderram J, et al. Rapid increase in hospitalization and mortality rates for severe sepsis in the United States: a trend analysis from 1993 to 2003. Crit Care Med. 2007;35:1244-50. De Kock I, Van Daele C, Poelaert J. Sepsis and septic shock: pathophysiological and cardiovascular background as basis for therapy. Acta Clin Belg. 2010;65:323-9. Angus DC, van der Poll T. Severe sepsis and septic shock. N Engl J Med. 2013;369:840-51. Wu LL, Tang C, Dong LW, et al. Altered phospholamban-calcium ATPase interaction in cardiac sarcoplasmic reticulum during the progression of sepsis. Shock. 2002;17:389-93. Vieillard-Baron A, Caille V, Charron C, et al. Actual incidence of global left ventricular hypokinesia in adult septic shock. Crit Care Med. 2008;36:1701-06. Sawchuk CW, Wong DT, Kavanagh BP, et al. Transthoracic echocardiography does not improve prediction of outcome over APACHE II in medical-surgical intensive care. Can J Anaesth. 2003;50:305-10. Isaaz K, Thompson A, Ethevenot G, et al. Doppler echocardiographic measurement of low velocity motion of the left ventricular posterior wall. Am J Cardiol. 1989;64:66-75. Dokainish H, Zoghbi WA, Lakkis NM, et al. Optimal noninvasive assessment of left ventricular filling pressures: a comparison of tissue Doppler echocardiography and B-type natriuretic peptide in patients with pulmonary artery catheters. Circulation. 2004;109:2432-9. Nagueh SF, Smiseth OA, Appleton CP, et al. Recommendations for the evaluation of left ventricular diastolic function by echocardiography: an update from the American Society of Echocardiography and the European Association of Cardiovascular Imaging. J Am Soc Echocardiogr. 2016;29:277-314. Sohn DW, Chai IH, Lee DJ, et al. Assessment of mitral annulus velocity by Doppler tissue imaging in the evaluation of left ventricular diastolic function. J Am Coll Cardiol. 1997;30:474-80. Nagueh SF, Lakkis NM, Middleton KJ, et al. Doppler estimation of left ventricular filling pressures in patients with hypertrophic cardiomyopathy. Circulation. 1999;99:254-61. Sundereswaran L, Nagueh SF, Vardan S, et al. Estimation of left and right ventricular filling pressures after heart transplantation by tissue Doppler imaging. Am J Cardiol. 1998;82:352-7. Diwan A, McCulloch M, Lawrie GM, et al. Doppler estimation of left ventricular filling pressures in patients with mitral valve disease. Circulation. 2005;111:3281-9. Mullens W, Borowski AG, Curtin RJ, et al. Tissue Doppler imaging in the estimation of intracardiac filling pressure in decompensated patients with advanced systolic heart failure. Circulation. 2009;119:62-70. Santos M, Rivero J, McCullough SD, et al. E/e' ratio in patients with unexplained dyspnea: lack of accuracy in estimating left ventricular filling pressure. Circ Heart Fail. 2015;8:749-56. Hillis GS, Moller JE, Pellikka PA, et al. Noninvasive estimation of left ventricular filling pressure by E/e' is a powerful predictor of survival after acute myocardial infarction. J Am Coll Cardiol. 2004;43:360-7. Park SJ, Lee SC, Jang SY, et al. E/e' ratio is a strong prognostic predictor of mortality in patients with non-valvular atrial fibrillation with preserved left ventricular systolic function. Circ J. 2011;75:2350-6. Pulido JN, Afessa B, Masaki M, et al. Clinical spectrum, frequency, and significance of myocardial dysfunction in severe sepsis and septic shock. Mayo Clin Proc. 2012;87:620-8. Sevilla Berrios RA, O'Horo JC, Velagapudi V, et al. Correlation of left ventricular systolic dysfunction determined by low ejection fraction and 30-day mortality in patients with severe sepsis and septic shock: a systematic review and meta-analysis. J Crit Care. 2014;29:495-9.